With the release of AMD's 2nd generation APUs, which features built-in Radeon Vega graphics, it is now possible to offer a fully built AMD system at a very competitive price. Get £50 off this system when purchased with a Ryzen 5 2600/2600X or the Ryzen 7 2700/2700X, while stocks last. See this link for more details. We are proud to announce our quiet fanned Serenity AMD Value, housed in the Riotoro CR480 chassis - the perfect choice in performance and style. At its core the PC feature AMD's very latest 2nd generation APUs that integrate Radeon Vega graphics. These are AMD's first Ryzen CPUs to include a dedicated GPU chip. Our aim is to provide one of the world's quietest PCs without compromising performance. We have therefore chosen only the best and quietest components for this PC. The AMD APUs are supplied with a CPU cooler which are reasonable in terms of quietness and performance. But we highly recommend that you opt for one of the coolers in the configurator as they will not only perform better but will also be much quieter. Our recommendation is the NF-U12S SE-AM4 which is an excellent and exceptionally quiet CPU cooler manufactured by Noctua. As previously mentioned, the 2nd generation APUs now have a built-in GPU. The Ryzen 3 CPUs feature a GPU chip that runs at 1100 MHz and has 8 GPU cores. This results in good gaming performance and the ability to play/stream any media you care to throw at it. If you are looking for better performance (especially when gaming) then the Ryzen 5 CPUs are the best option. It features a total of 11 GPU cores while running at 1250 MHz, giving it the edge over the Ryzen 3. Finally, we have AMD's Athlon 200GE, which is ideal for customers looking for a cost effective solution. It is a dual-core APU that has a total of three graphics cores that run at 1000MHz. Of course, it is still possible to add a dedicated graphics card at any time if more performance is required. The idea behind the Serenity AMD Value is to have a great performing PC without breaking the bank, which is why we opted for the ASUS A320M-A motherboard. This feature rich motherboard offers a total of three video outputs, an ultra-fast M.2 port, ASUS' 5X Protection III, USB 3.1, support for up to 64GB DDR4 and ample opportunity to add additional storage devices. 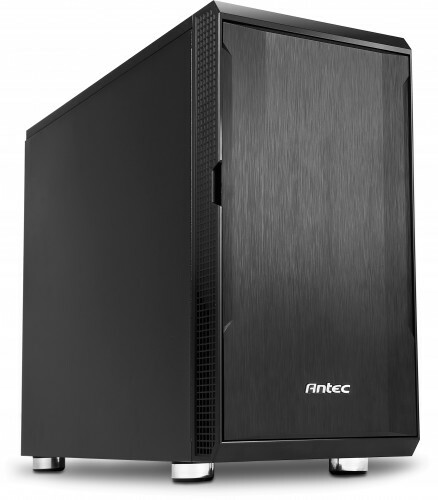 Cooler Master Masterbox Q300L Micro-ATX PC Chassis ? ASUS PRIME A320M-A Micro-ATX AM4 Motherboard ? ASUS TUF B450M-PLUS Gaming AM4 Micro-ATX Motherboard ?